The redevelopment of Olden Avenue in Ewing, New Jersey resulted in a number of new businesses entering the area, including a new Walgreens pharmacy. The new store is approximately 14,340 square feet and includes a parking lot with 56 parking spaces. Designing a stormwater management system for this site presented a number of challenges. Because of invert constraints, it was necessary to tie the proposed stormwater conveyance system to the existing infrastructure so the existing headwall at the discharge point could be left undisturbed. Also, since a portion of the site is within a flood plain, a net fill calculation with a New Jersey Department of Environmental Protection (NJDEP) Individual Permit was required. In addition to Township level approval, the project had to be reviewed and approved by the New Jersey Department of Environmental Protection and the Delaware & Raritan Canal Commission, each of which has stringent rules and regulations regarding the stormwater management and water quality for the development. The solution the engineers designed called for three Contech treatment devices; a CDS® hydrodynamic separator, a Peak Diversion Stormwater Management StormFilter®, and a Jellyfish Filter®. Each system treats a different area of the site. Since a detention basin could not be used on the site, all units were sized per the peak runoff rate for a NJDEP water quality storm. The CDS hydrodynamic separator was used on a portion of the site that was previously developed and requires 50% TSS removal. The CDS uses swirl concentration and continuous deflective separation to screen, separate and trap trash, debris, sediment, and hydrocarbons from stormwater runoff. The two remaining areas needed to achieve 80% TSS removal per the NJDEP regulations regarding major development of previous pervious land. 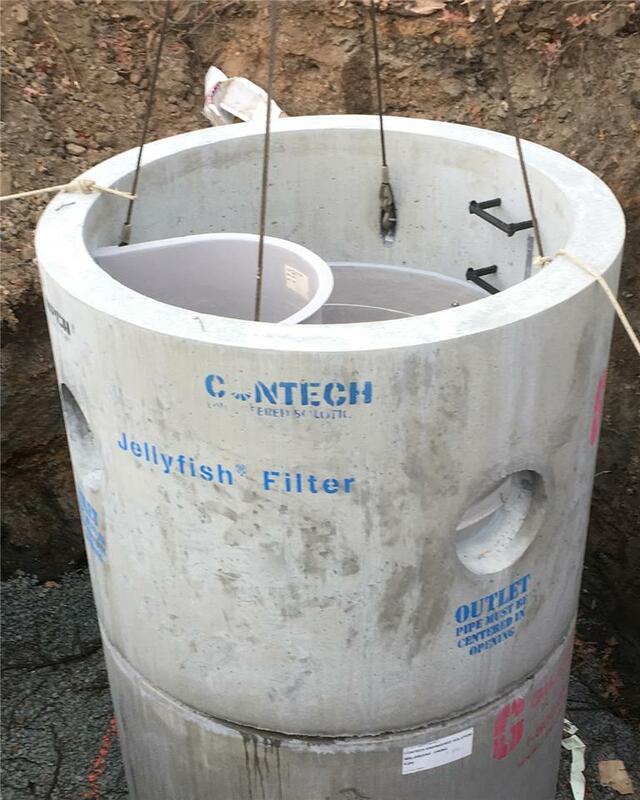 Contech worked with the engineers to leverage the design advantages of the StormFilter and Jellyfish Filter to develop the most economical design. A Peak Diversion StormFilter was used in an area of the site with ample rim to invent elevation. The StormFilter uses rechargeable, self-cleaning, media-filled cartridges to absorb and retain pollutants from stormwater runoff. The Peak Diversion StormFilter provides off-line bypass and treatment in one structure, eliminating the cost and installation of structures to bypass peak flows. The StormFilter cartridges were filled with Perlite, a form of expanded volcanic rock. The porous, multi-cellular structure and rough edges of Perlite make it effective for removing TSS, oil, and grease. A Jellyfish Filter with a hatch was used in an area of the site that had depth limitations. The Jellyfish Filter provides high flow pretreatment and membrane filtration in a compact stand-alone system. Contech provided sizing calculations as part of the application package. Also, budget costs were provided so the cost impact to the project was known ahead of time, and would not become a surprise at construction stage. A Contech Field Representative was on site to guide and assist the contractor during installation, and all three systems were installed in just one day.